The family of a young man taken in tragic circumstances has revealed the last moments he spent surrounded by his closest mates. 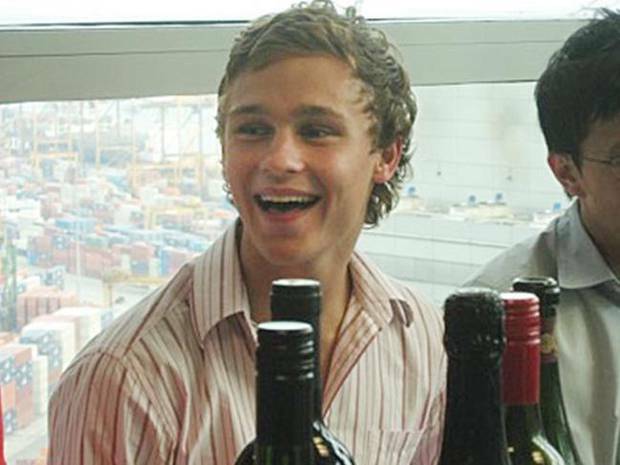 Sam Ballard, 29, died on Friday, eight years after he was dared to eat a garden slug at a gathering in a friend's backyard. He's now helping organise his best mate's funeral. Sam became ill the day after eating the slug. He complained of serious pain in his legs and told him mum in the emergency room that he was worried it might be the result of what he'd eaten. She was reassuring, but doctors soon discovered that a rare condition was taking hold of the young man's body. He had been infected with rat lungworm disease, otherwise known as eosinophilic meningo-encephalitis. The slug Sam ate contained the worm that is usually found in rodents but can spread to molluscs that eat the rat's faeces. Sam fell into a coma for an agonising 420 days and woke with an acquired brain injury. Puppies can get this disease; breeders I have known have surrounded the pups enclosure with a snail-proof barricade. The breeders take it very seriously, it is fatal to pups as well. I wonderful if it's safe to eat farm fresh escargot? If overcooked, the meat is tough; undercooked, there's the risk of getting this nasty disease. If you are eating them contact the grower and ask what precautions they are taking perhaps. Usually if meat is completely cooked it is safe to eat. Don't know about snails, though! Tough hombres Lissa ;-) snails have survived for at least thousands of years. The ones we eat I guess are the same species as the feral ones which are exotics, so adaptable survivors. I'm not so keen on the 'rare' cook up of meats -- pork especially. I think pork's proscription in some cultures may be due (going way back) to the pig's eat-anything diet and potential as a pathogenic carrier. Nonetheless,the consumption of undercooked beef (e.g., shabu-shabu, Korean yukhoe, Japanese yukke, Vietnamese pho) in many Asian countries may be compatible with the interpretation that a specific beef factor, suspected to be bovine viruses may contaminate beef preparations and lead to latent infections in the colorectal tract. The same pattern isn't evident in Arab and lamb eating countries as lamb may be free of these viruses. Ironically, raw fish is pretty safe despite the occasional presence of parasites. But in Japan raw fish is frozen overnight prior to eating to prevent infections from parasites. As well, vinegars and salting (as in Sushi) will have a similar antibacterial effect. And I say that as I'm salting raw squid at the present time. But I delight in feeding big snails to my chooks! Not so lucky are tawny frogmouths and various other avian and mammalian wildlife species, including brushtail possums and flying foxes (macrobats). These also get infected through the ingestion of slugs or snails containing rat lungworm larvae. Most affected wildlife die a slow and painful death as a result of these infections. They tend to ingest large numbers of larvae and their small spinal cord is easily damaged through parasitic migration. The same article points out;"Don’t leave dog bowls in places where they can be overrun with slugs and snails." 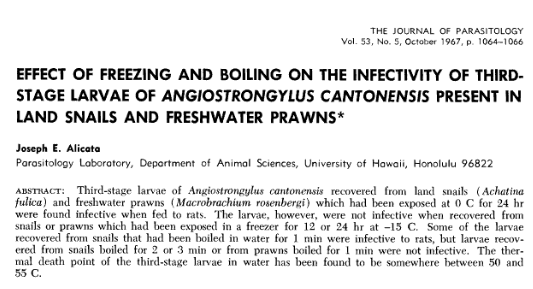 As for preparing escargot so that you don't get infected with Angiostrongylus cantonensis-- here's a very relevant discussion-LINK. Fortunately, we have not seen a snail in this backyard for a couple of years. We said that about cane toads a few years back but the toads have come back. Terrible to think a young bloke could die the way he did. We once found a tick on one of our past dogs and took it to the vet who said the tick most likely came from a possum in the area. A lot of animals carry parasites and bugs etc. Maybe we could do with a cleanse every now and again. Lizards and reptiles can carry tapeworms etc. and dogs forever chase little lizards.